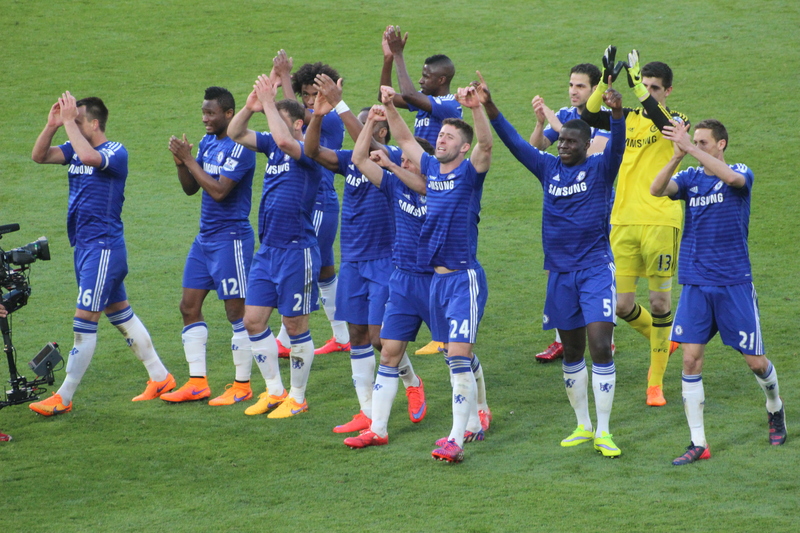 Chelsea vs. Manchester United : 18 April 2015. For the first time in ages, I spent a Saturday morning at work in Chippenham. However, with the Chelsea vs. Manchester United game not kicking off until 5.30pm, I was still able to finish at midday and reach London in good time. Glenn had collected PD and Parky en route. I then took over and headed in to London. If I am honest, I was slightly nervous about the early-evening game. Without Diego Costa to cause panic and concern in the United ranks, and with a few key players hitting a dry spell, I was very wary that we just might be catching an in-form United at the wrong time. I soon commented to my three companions that a draw would suffice. A win would be lovely, of course, but I was aware that we were not, collectively, setting the bar too high. We were becoming as pragmatic as our manager. The game at Stamford Bridge, however, was not the only football match troubling me. My local team Frome Town had lost on the previous Wednesday to a gut-wrenching last minute goal at local rivals Paulton Rovers and with two games left of the season, were only three points clear of relegation from the Southern League. A little part of me toyed with the notion of watching the first-half of the Slough Town vs. Frome Town game before heading in to London. I decided against it. Who the hell watches halves of football games? Not me. Heading east along the M4, the weather was magnificent. It was a lovely day for football. I spotted a few Reading scarves and immediately dismissed the afternoon’s FA Cup Final as unimportant, and not worthy of further thought. This, in a nutshell, shows how the importance of that once revered competition has decreased. The game at 5.30pm would be my thirty-third Chelsea vs. Manchester United match at Stamford Bridge, dating back to a Saturday just after Christmas in 1984 – Glenn was with me on the benches, and I am sure many readers were there too – when I set eyes on those famous red shirts for the very first time. Thirty-three games. It’s quite a number. I have only seen the reds of Liverpool more often than the reds of Manchester at The Bridge. Interestingly – or not, as the case may be – a split of the first sixteen games and the second sixteen games against United reveals a seismic shift in results. The two losses against United in that second period are quite recent too; a Champions League defeat in 2011 and a League defeat in 2012. For quite a while at Stamford Bridge, we have held the upper hand. Among the wins, two stand out. The 5-0 annihilation in 1999. The 3-1 title-clincher in 2006. Two of the happiest of days in almost forty-five years of supporting Chelsea. Where did the time start? I am sure that I am not the only Chelsea supporter who often thinks back upon the first few moments of our support and attempts to discover the defining moment when Chelsea became our team and our club. I’ve personally tied this down to a moment in my primary schoolyard in the first few weeks of spring term 1970 and those events have been detailed here before. As I have been coming to terms with the events of the past two months, there have been many hours spent thinking back on my childhood years. Another trip down memory lane coming up everyone. I am sure that I am not alone in my quest to attempt to assemble some sort of time-line of devotion, possibly involving memories of certain early games, conversations with friends, TV clips, pictures, favourite players and the like, which aid us to remember those critical moments when Chelsea became our team. After my first game in 1974, it’s easy, remarkably easy. Before that, things get a little blurred. Of course, some of my earliest memories involve Chelsea’s appearances on TV and of other games too. Knowing my parents, it is very likely that I was not allowed to stay up to watch “Match of the Day” on Saturday nights on BBC1 in the first few years of my growing love of football – let’s say 1970 to 1972 – because of the 10pm start. My TV-watching in these years was, I think, limited to watching ITV’s “The Big Match” on Sunday afternoons. Yes, the memories of this are clearer. I even have feint recollections of a sun-drenched Stamford Bridge in the days of the old East Stand, prior to its destruction in the summer of 1972. The earliest football game per se that I can ever remember seeing is the 1972 FA Cup Final, when an Alan Clarke header gave Leeds United a 1-0 win over Arsenal. Which is the first Chelsea game that I can remember watching? I’m pretty sure that it is the Chelsea vs. Leeds United home opener in August 1972 – with me, just over the age of seven – when 51,000 crammed in to a three-sided Stamford Bridge to see a 4-0 win, no doubt abetted by the fact that Leeds’ goalkeeper was injured and was replaced by Peter Lorimer. Typically, Peter Osgood scored. In that season, I can also remember the Chelsea vs. Arsenal FA Cup game in March 1973, when there was an incredible buzz in the village school leading up to the match. Peter Osgood’s screamer in that game won the goal of the season that year. I also remember seeing the highlights of the replay on the nine o’clock news the following midweek, after pleading with my parents to allow me to stay up later than normal to watch. I can remember the sadness of defeat from that evening forty-two years ago. I am sure that this song was sung at the village school on the Monday, possibly by the younger children watching us older boys playing football on the school yard. I am also positive that a few of us re-enacted Peter Osgood’s goal in that game too, when he almost stumbled as he forced the ball over the line. His “to camera” shrug of the shoulders, as he was kneeling in The Shed End goal, was impersonated by me for sure. I was lucky enough to meet Peter Osgood on several occasions and I was very honoured to be able to shake Sir Bobby Charlton’s hand as he brushed past me at Old Trafford last season. Two iconic players from my early football world remembered. A Chelsea vs. Manchester United match first appeared on my football timeline, then, in April 1973. Incidentally, while at the Frome Town match on Wednesday, I was rather taken aback when my friend Steve announced that the very first Frome Town game that I had seen – with my mother – was neither in 1971 nor 1972 as I had first thought but, in all probability, as early as 1970, when I was just five. Let me explain. During a summer holiday at a Dorset caravan site, I often played football with a former Bristol Rovers player called Mike Brimble, who was now playing for Frome. My father didn’t tend to like kicking a ball around with me – I remember he often used to “toe poke” the ball, which I didn’t approve of – ha – but I spent many hours kicking the ball to-and-forth with this chap from the adjacent caravan. There is no doubt that, during the kick-abouts with Mike, on hearing that I was a Chelsea supporter, that he would have mentioned our cup win against Leeds United that spring. And there is no doubt that this would have left a lasting impression on me. After a week or so, my mother took me to see Frome Town play…we lost heavily…and I can remember to this day the little conversation I had with Mike at the end of the game. I was so happy that he remembered my name. I always thought that it was in 1971 or 1972, but Steve told me on Wednesday that Mike’s last season for Frome was 1970-1971. So, that game – with my mother – was undoubtedly as early as early autumn 1970. 1970 was obviously a defining year in my life. It was the year that I chose Chelsea Football Club and it was the year that I saw my very first football match. My football timeline had begun. While out in the full-to-overflowing beer garden of The Goose, Alan and I spoke about these early moments in our football, er Chelsea, life. The first game that Alan can remember seeing on TV was the 1970 FA Cup Final. I’d bet that many Chelsea fans’ timelines began in this year. 1970 and Peter Osgood. One and the same. I mentioned to Alan about the nervousness that I had with the Frome Town game. His local team, Bromley, were on the brink of promotion from the Conference South to the Conference. We hoped for a triple of wins during the next few hours; Bromley, Frome Town and Chelsea. A text from a Frome Town follower in California – yes, really – informed me that Slough were 1-0 up against Frome. I groaned. He then texted me to say that the team three points below Frome, Arlesey Town, were a goal up at the high-flying Truro Town. I groaned again. If it stayed like this, it would all go to the last game of the season and relegation would be a distinct possibility. Elsewhere in the beer garden, there were mixed thoughts about the upcoming game. Some were positive, some were cautious. We prayed for a fit Loic Remy leading the line. When we heard that Didier Drogba had been chosen, our spirits sank a little. At 36, he is not the man of 2012. I reconfirmed my view that a draw would be good enough for me. Then, better news…Frome town had equalised at Slough Town. Then, just after 4.30pm, came some wonderful news. Truro City 2 Arlesey 1 . Fantastic. In the end, Frome drew 1-1 and Arlesey lost 3-1. Safe, barring a deluge of goals next Saturday, for another season. Bromley, meanwhile, had beaten Weston-Super-Mare 3-0. Beautiful. Outside the West stand, I took a long-overdue photograph of Alan in front of the Peter Osgood statue. We were inside with fifteen minutes to spare. The United hordes were already in good voice. I noted two flags playing on the point of United fans being “Manchester Born & B(red)” as if they have to constantly state, to the point of tedium, about Manchester being their territory and not City’s. Anyway, the United fans always put on a good show and they didn’t disappoint, singing loudly, in the first-half especially. There was nothing but pure blue skies overhead. Despite the bright sun, there was a cold wind which blew in and around Stamford Bridge throughout the game. As the sun lowered, changing shadows formed different geometric shapes across the pitch and the towering East Stand. Courtois – Dave, JT, Cahill, Ivanovic – Zouma, Matic – Hazard, Fabregas, Oscar – Drogba. The big news was King Kurt alongside Matic, with Fabregas pushed forward. We presumed Jose wanted to toughen up that area, with a nod towards the improving Fellaini. The first-half was a mainly frustrating affair. We began well, but United soon started pushing the ball around, and I lost count of the number of times that our right flank was exposed. Ivanovic, the former centre-back, tends to drift inside too often for my liking. Ahead of him, Oscar provided little cover. United peppered our goal with a few long range efforts, but thankfully their shooting was amiss. I noted how deep Wayne Rooney was playing. We gave him, and others, too much time and space. I longed for our midfield to get closer. It was Rooney who struck a shot against the back stanchion of the goal, and it looked to me – and the away fans – that it was a goal. I looked at Alan in disbelief. As Juan Mata, much loved during his relatively short spell with us, walked over to take a corner down below us, the Matthew Harding stood and clapped generously. It was a fantastic moment. I am trying hard to remember the last time we gave a former great a hard time. A run by an energised Fabregas deep in to the penalty box at the Shed End raised our spirits. But, our chances were rare. Drogba battled on, but often his touch ran a yard too short or too long for the supporting midfielders. United continued their dominance of the ball, and only rarely did our midfielders bite at their heels. The atmosphere was good, though. The underperforming Chelsea team was thankfully not matched by the support in the stands. We roared the boys on. With the half-time interval in sight, John Terry broke up another United move and fed the ball to Fabregas, who in turn passed to Oscar, now central. As soon as Oscar adeptly back-heeled the ball in to the path of a raiding Hazard – a magnificent touch – I sensed a goal. Eden calmly advanced and slotted the ball in to the United goal. Inside, my body buzzed. There was only one thing for it. There is a walkway right behind where I sit and I leapt up the three steps to my right, took off my sunglasses, and just jumped up in the air continually for a few seconds. There were smiles of relief everywhere and The Bridge boomed. Into the second-half, the first big chance fell to us. Matic won the ball and played the ball on for Drogba. I immediately wished for a time machine that could send Didi back to his powerful and absurdly potent form of five years ago, fearing that Smalling would easily deal with him. To be fair, Didier assembled just enough strength to stab a ball at De Gea, despite Smalling’s attentions. The ball took a bizarre path towards goal, deflecting off both United players, but landing just too far past the far post for the on-rushing Hazard to control. In the end, he did so well to get any attempt in on goal. Bizarrely, his flick touched the ball up on to the bar. Zouma grew throughout the game. His war of attrition with Fellaini was pure box office. Ramires replaced Oscar. Juan Mata did not create too much for United; good lad. Falcao, not firing on all cylinders, cut in on goal in a similar to position to Hazard’s goal, but his powerful shot rose and hit the side netting. The atmosphere remained noisy throughout the second half, but there was incredible tension as the game grew older. United still dominated. Chelsea constantly defended well. It was, no doubt, a typical Mourinho performance. I would have liked to have seen more attacking verve, of course, but our time for that had passed. The salad days of autumn are over; it’s now all about putting meat on the plate. Juan Mata received a fantastic and heartfelt round of sustained applause as he was substituted. United continued to attack. Shots were dealt with. Nerves were continuing to be frayed. The last meaningful moment caused immediate concern. Herrera and Cahill met in a corner of our penalty box. From over a hundred yards away, it looked a penalty, to Glenn, to Alan, to me. However, miracles happen and the referee Mike Dean – who had been the target of increasing levels of abuse from the home fans as the game continued – waved it away. Four minutes of extra time. We waited, but with fantastic noise continuing to boom around the packed stands. I captured a few shots of players hugging, smiling, and enjoying the moment. “One Step Beyond” boomed out. After clapping us, they began to walk away, but John Terry dragged them back and, in a tight line facing the Matthew Harding, they stood. Their joy was our joy. United in triumph. One step closer. Ten points clear. Mind the gap. There was another notch on my football time line. This entry was posted in Season 2014-2015 and tagged 1970-1971, 1972-1973, Atmosphere, Childhood, Eden Hazard, Flags, Frome Town, Juan Mata, Manchester United, Parents, Peter Osgood, Songs by Chris Axon. Bookmark the permalink. Mata after the match greeting all of our players. Pure class. Made me over the moon for us to give him such a good reception as well. Thanks for the write up. Well done again. Of course, being at the game, I never really saw that…think we were all exiting the stairs when this happened. Quality write-up. I’m a relatively newbie fan (2003), and a yank to beat. But also 50+ jumped and hugged all those around me with pure joy in The Shedon watching that ball glide between DeGea’s legs. Once Blue is in your Blood you bleed it and it’s the fix you never get enough of. Out of interest, which city are you based? Los Angeles / orange Coiinty area. Part of OC Blues in Santa Ana. Will be at Emirates this Sunday for what I hope is another 3 points.